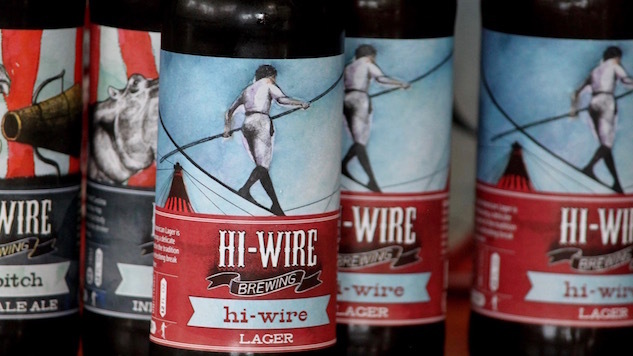 The Lager is the flagship for the brewery, and the label demonstrates the balancing act that Hi-Wire tries to accomplish in their beer. Hi-Pitch is a fruit-forward IPA with loads of grapefruit, but plenty of malt for balance. And then there’s Lo-Pitch, which is also citrus forward but comes in at a low 4.9% ABV. Talented dog, too. The Gose might be my favorite label. Is it weird that I like how I can’t see the top of her head? Also, Hi-Wire is now canning its beer. Cool. The labels get extra funky with the seasonal releases. This is a really light lager with soft peach notes. Hello summer. Twice as Nice is a lager built for cold weather. Smooth, malty, and 10% ABV. Hells yeah. The Enchanter Baltic Porter was aged on American white oak spirals, and delivers plenty of dark fruit, wood and chocolate notes. If spring is about rebirth, then Death Defying should be the official beer of the season. And I really want to hang out with the lady on that label. I’m starting to sense that bold women are a theme with Hi-Wire’s labels. It doesn’t get more bold that putting your head in a lion’s mouth. The label art takes a turn on Hop Circus, which I guess is appropriate since this is an experimental IPA, ever-changing and only available one month out of the year. Easily the darkest label of the lot, Pulcinella, a barrel-aged Russian imperial stout, has an Eyes Wide Shut thing going on. I’m not a huge fan of pumpkin beers. I typically have one a year, just so I can tick that box off my to-do list in the fall. But I do dig that elephant. Visitors often say that Asheville, which has one of the highest concentrations of breweries in the country, feels a bit like a circus, thanks to its vibrant street art and performance scene. Walk through town and you’re likely to see a man juggling swords while wearing high heels and balancing on a workout ball, a dude riding a tall bike in a nun’s habit, and a bluegrass band covering Snoop Dogg in front of a store that sells “healing crystals.” It’s weird. Asheville’s Hi-Wire Brewing, which took home a gold at the 2016 GABF for its marzen, embraces that weirdness with their label art, which has a vintage-circus aesthetic that runs consistently through most of their releases. The artwork is as beautiful as it is weird, and perhaps more important, it’s fun. Who doesn’t love a bearded lady, or a dog playing a horn? Here are 12 Hi-Wire labels that we absolutely love.